Lookalike Martin from Wakefield goes on to appear in club's video announcement. 🤦‍♂️@skysports_PatD thought he had found Jan Siewert, the bookies favourite for the #HTAFC job, in the John Smith's stands…. 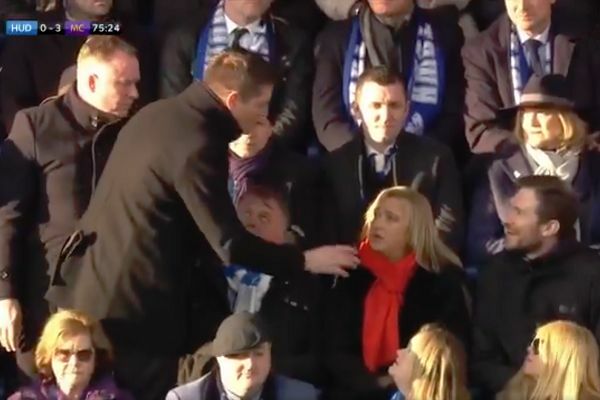 A fan in the stands at Huddersfield was mistaken for Jan Siewert, set to become the side’s next manager, by Sky Sports who sent a reporter out to interview him in his seat. Midway through the second half of a clash with Man City at the John Smith’s on Sunday, lookalike Martin Warhurst from Wakefield ended up speaking to the TV man. Basically what happened is I was sat in the crowd and suddenly I was aware of a guy coming towards me from the right hand side. I laughed and said, “No, no, that’s not me. I’m Martin from Wakefield”. That was all I heard of it and then suddenly everybody’s phones and my phone started going crazy, saying “I’ve just seen you on telly”. There was lots of reaction from people in the crowd – just people coming up and having selfies and people patting me on the back and wishing me luck. I’m a much more attractive guy. My tip, if I were the Huddersfield manager playing against a team like Manchester City, I think if they played a formation of 5-5-5 they might actually stand a chance! The club have now formerly appointed Jan Siewert to succeed David Wagner as manage and made light of the incident in their announcement on social media.